I really wasn't sure what to expect when I first started this book, all I really knew about it was that it was a historical fiction. I'm pleased to say that I ended up quite liking it, although there were a few minor aspects that held me back from loving it. 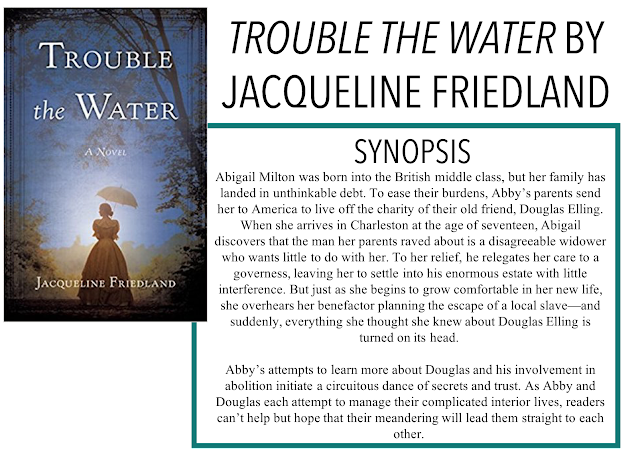 I am back with another book review, Trouble the Water by Jacqueline Friedland. Thanks so much to Book Sparks for sending me a copy of this book for an honest review as part of #SRC2018, as always, all opinions are my own. The story follows 17-year-old Abby, who is venturing from her home in England to Charleston, South Carolina in 1845 to stay with a family friend of her father's and recent widower, Douglas Elling. She is all too happy to leave behind her repulsive, handsy uncle and start fresh in America. Between her studies and making friends with the other well-to-do girls in the city, Abby doesn't have much room for getting to know her guardian and takes his standoffish, cold nature as typical. But one day, she overhears a conversation where Douglas plots the escape of a pregnant slave girl, and all her preconceived notions of Douglas are flipped. I will admit, I haven't read many historical novels, especially those with such an emphasis on abolition and slavery. However, I was really engrossed by the story and found Friedland's depictions of these issues interesting. I'm actually taking a Latin America History course right now, and while we are talking about slaves in a different part of the world, there is definitely a lot of overlap between slavery in both these locations. Obviously, at the time, many were against the abolition of slavery, largely because of the economic benefits, and Friedland portrays that very clearly. She also includes perspectives of characters who have differing opinions on the matter. Douglas is clearly against slavery, Abby comes to be against it but initially doesn't recognize it as something to be concerned with, and a few other minor characters discuss their being for it - either as heads-of-households or just as people who have grown up in it and don't see the problems with slavery. While slavery is a major aspect of this book, we also see the story unfold from three perspectives, Abby, Douglas, and Gracie, one of Abby's new friends. There is definitely a lot going on, plot-wise, in this book, but I would tentatively call this a romance novel. There is also some scheming and plotting, as well as a lot of social issues, but I think the core of the story follows the romance. I think Friedland did a good job writing this book, for the most part, the pacing was good, although it took me a bit to fully latch on to the story and for things to really get going with the plot, otherwise, I enjoyed it. I don't know that I was 100% on board with the romance, I almost felt like the story didn't really need it because the abolition storyline was doing a good job of carrying the story. Overall, I enjoyed this book and think it was a well-done abolition and slavery story, but not as great a romance story.